Hello. So I have the information clerk npc spawned and dialogue works fine. 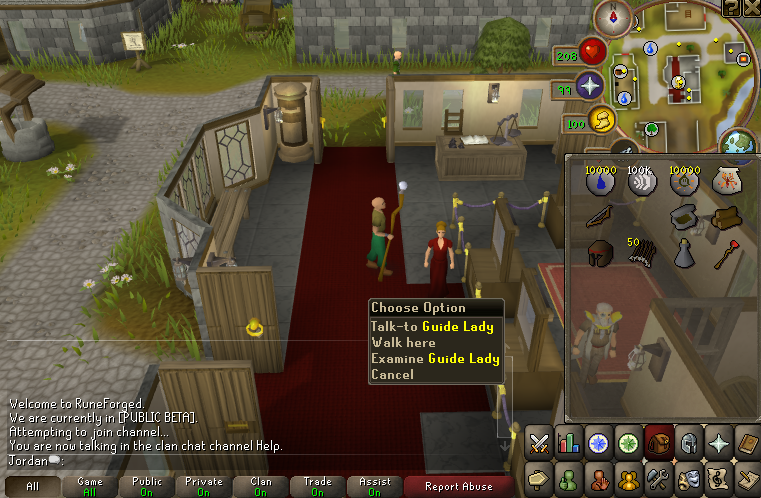 If I use King Fox's cache editor for 592 and change information clerk's name to 'Guide Lady', her npc skin sets to default one and her face doesn't show in dialogue box anymore. Been stuck for a while here. Many thanks! Yikes. Please don't put this in the process. This means every game tick you're doing a call to set the name and walk type of the NPC. This task is meant for the things above such as combat and walking/path scripts of NPC's. Also where did that 'id' variable come from? It's no where else in the method, how can you assume that it is the id of the NPC? Aside from this, setting the NPC name server sided has no affect on the visual name you click and see in-game. I'd maybe recommend going into some of your definition files client sided and finding the NPCDefinition file. The naming could vary depending on your client. From here you can check for the case of 5938 and set its name variable accordingly. is because 592 doesn't have a npc mask that allows you to change the npc name on demand like that. The realistic approach to this is to change the npc name in the cache. I'll give you a small cheaphax though. This way you also won't be setting the npc name each time "processNPC()" is called which iirc is every tick too. Tried Frosty's cache editor for 592 but it bugs out when I change npc names. It stops their faces showing in dialogue boxes and changes their appearance to old Runescape style. But it's the only cache editor that shows on Google for 592 unfortunately. Zero, I'll give it a go when I get in from work. You're awesome, cheers buddy! the naming is like that because of the automatic renamer from JODE. Wow thanks Zero!! I understand more now. Someone give this man lots of cake, lol! 1. How would one go about changing the dialog name of the NPC so that it reads the new name from the client? I'm guessing the client knows of the name change but the server doesn't. EDIT: I've set the NPC definitions name just before opening the dialog. Is this a decent way to do it? NPCDefinitions.getNPCDefinitions(npcId).name = "Guide Lady"; // !-- I ADDED THIS --!